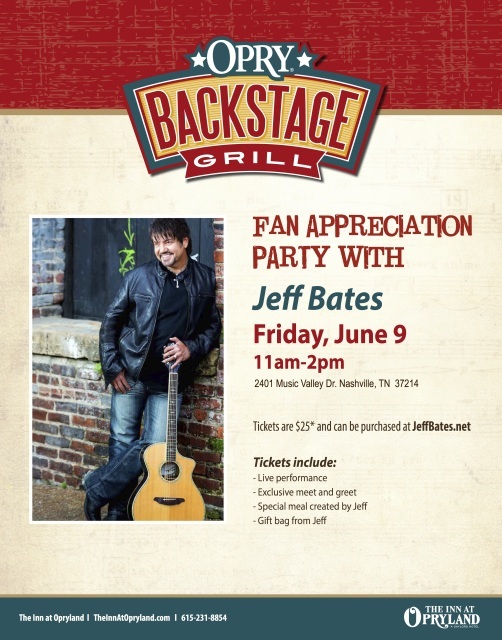 2017 Jeff Bates Fan Appreciation Party On Sale Now! Jeff Bates will have a Fan Appreciation Party on Friday, June 9th, 2017 from 11 AM to 2 PM at the Opry Backstage Grille. Tickets are $25 and include: lunch, performance, meet & greet, and gift bag. See our complete 2017 CMA Fest Fan Club Party listing here!